Well, I’m a bad blogger. I have not been taking my own advice and keeping my regular blog days lately. I have a good excuse. I’ve been sick on and off for the past 10 days and I’m so busy with creative projects, it’s hard to think of blog topics that are fresh and worthy of your time. But some of you do follow this blog. I get enough traffic even without posting, that my numbers hardly drop, so that’s encouraging, and I’m grateful. But here, at least is some news. 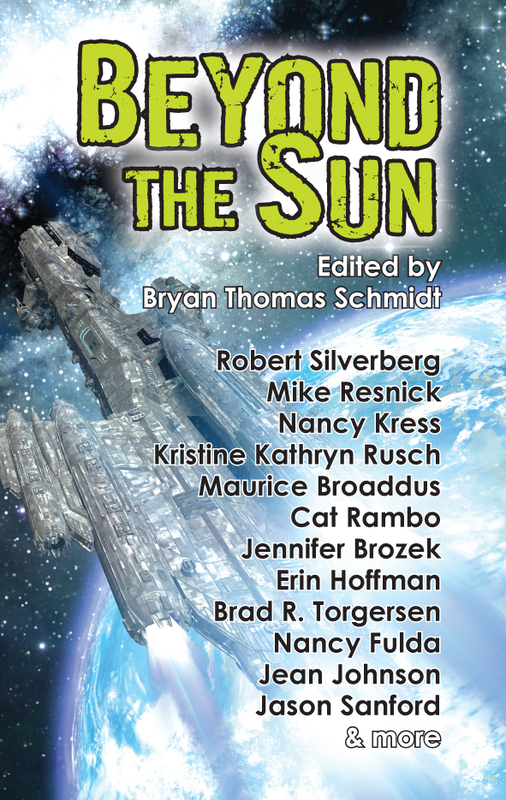 We released the cover for Beyond The Sun in its final incarnation. I am finishing manuscript prep on that now and will turn it in tomorrow to Fairwood for July release. I’ll have Advanced Reader Copies in April. Hard to believe. What a ride it’s been since I dreamed this up in August, and here it comes! There are some truly great stories in this, though, so I can’t wait to get it out in the world. In case anyone missed it, the cover is included here. 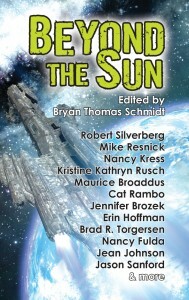 A full Table Of Contents can be found at http://www.sfsignal.com/archives/2013/01/toc-beyond-the-sun-edited-by-bryan-thomas-schmidt/. Also, Abraham Lincoln Dinosaur Hunter: Land Of Legends, the first chapter book in my fun new scifi alt history series for young readers released after a delay on my birthday, February 13, 2013. The day after Lincoln’s birthday, by the way. So far sales are steady and I know they’ll only increase when reviews pour in. That cover and more info can be found here: http://bryanthomasschmidt.net/writings/childrens-books/. I have started the first novel in a new scifi series. Garret Hawke, Lunar P.I. is a detective noir set in colonies on the moon. The first story has Hawke’s young neighbors’ baby murdered and the parents accused, when he sets out to clear them. This is a world of A.I.’s called Synthetics, where humans live underground because of radiation and Synthetics cover the above ground work. Colonies have only existed on the moon for 15 years, in this 22nd Century setting. Each book will stand alone but there will be some through arcs to the storylines that continue in each consecutive book. Again, illness has slowed me down, but I’m hoping to get this done by April 1st. After that, I have to write the next Abraham Lincoln Dinosaur Hunter, and then, depending on response, perhaps start book 2 in The Dawning Age. (see next paragraph). Plus, I have the May issue of Blue Shift to turn in this week. And I have 3 other partial novels I can resume work on. I have agents looking at Duneman, Book 1 in my epic fantasy/steampunk mix, The Dawning Age. Excited to see what comes of that. Raygun Chronicles is 1/4th funded in Kickstarter, but hopefully the next 15 days will turn that around so I can release that. There’s some awesome writers attached. I’d hate to see it fail. But Kickstarter is a giant waiting game. The t-shirts though are awesome and to die for. I think people will really want those! Jennifer Brozek and I also signed a contract with Baen Books to edit what we hope will be series of military fantasy anthologies, called Shattered Shields. Coming in 2014, you can find details on writers, etc., here: https://www.kickstarter.com/projects/601968027/raygun-chronicles-space-opera-science-fiction-anth/posts/405709. And I also have a YA reprint anthology in the works and so far have Cory Doctorow, Robert Silverberg, Mike Resnick, Jay Lake, EC Myers, and several others committed to that. So, as you can see, I have a good excuse for being too busy to blog but I will be doing another Write Tip later this week, and I hope to get more active again soon. Thanks for following and cheering me on! — Sequel to The Worker Prince, 2nd in the Saga Of Davi Rhii space opera trilogy, a bit of a rough launch and sales are still slow but I feel very proud of the progress in my writing shown here and the story. Blurbed on the cover by Mike Resnick, Paul S. Kemp (Star Wars), and Howard Andrew Jones. — my first children’s book, written in January, ebook only. Also my first humor book. Cute artwork by Evan Peter. A lot of fun. — La Migra: my first print magazine short story, third short story I ever wrote, sold in El Paso in early Summer 2011, and set there, it finally made publication. by David Lee Summers (Editor), Bryan Thomas Schmidt (Author), etc. — edited by dear friend Jaleta Clegg, a fellow novelist, my first space opera humor piece, third anthology appearance: Duncan Derring & The Call Of The Lady Luck. Some great stories here despite a rough road to publication for us all. Duncan Derring will also appear in Triumph Over Tragedy in January 2013, my first 2nd sale of a short story. by Jaleta Clegg (Author/Editor), Frances Pauli (Goodreads Author)(Author/Editor), Bryan Thomas Schmidt (Author), etc. A very productive and awesome year which also saw me start earning significant income from editing in the Fall, with 3 anthologies sold and 5 more in the works, including collaborations with John Helfers, Rich Horton and Maurice Broaddus. I also joined White Cat Publications to edit Blue Shift Magazine, a new semi-pro science fiction zine which debuts in May 2013, but which I did most of the buying for in November 2012. I finally finished the epic fantasy novel started in January 2010 and will be querying agents with hopes of my first major publishing novel deal. I survived my first full year back in Kansas, attended my first World Con, moderated my first World Con panel, appeared on my first World Con panels, and attended 5 Conventions and 6 signings. Also, The Worker Prince earned out its advance and went into profit in October. So, it’s been a pretty fun and exciting year. And 2013 is already headed toward being even more exciting, with 3 books expected to release, 2 anthologies, and hopefully a few more short story and anthology sales. I also hope to write 2-3 novels and 2-3 children’s books, land agents for both adult and children’s and become a full SFWA member. Maybe I’ll even start dating again or something wild and crazy like that. Ha! Who has the time? Let’s not go off the deep end, now! Thanks all for the interest and support. I’ve gotten questions about this since I started tweeting about in July when I wrote and finished my first draft at 13k for this new book. Basically, it’s a chapter book for early readers, ages 6-10, in this case probably aimed more at boys. The idea itself was a collaboration with Jeff Rutherford for whom I blog at www.tobereadbooks.com and for whom I am primary editor. 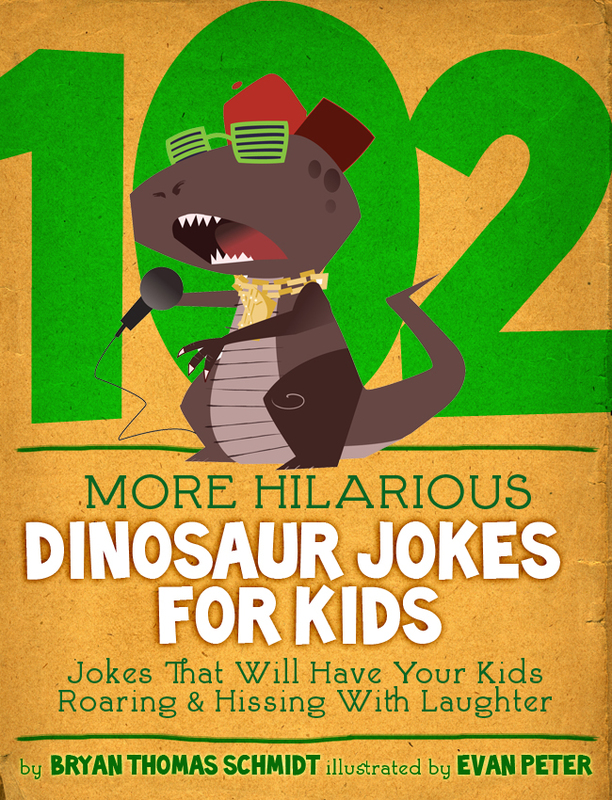 He also contracted me for four books, the first of which, 102 More Hilarious Dinosaur Jokes For Kids, is out since August and in the Top 10 for its category. It’s ebook only, at the moment, but print may be in the works. Abraham Lincoln: Dinosaur Hunter is intended to be a series of science fiction adventure stories. The idea came from our mutual love of history, my desire to do something more for kids with dinosaurs, and Jeff’s desire to produce books for kids like his own. The basic concept came from putting our ideas together: Abraham Lincoln as a boy winds up hunting dinosaurs with Davy Crockett, who is in his early 30s. We knew we wanted a T-Rex. We knew it would involve a time machine. 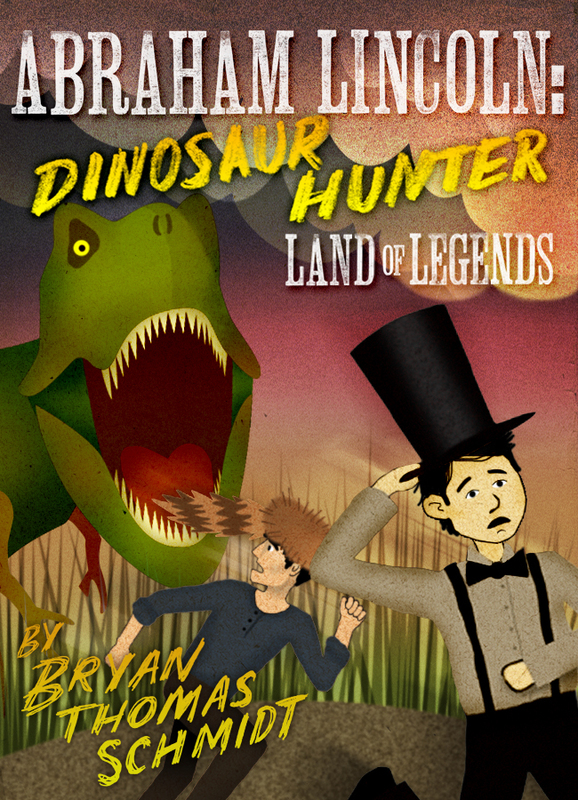 After that, I went off and wrote the specifics and book 1, which I’ve titled “Land Of Legends.” It’s the story of how they meet and wind up going back in time, and their introduction to the dinosaur world. Now, as you may have guessed from the concept, it’s science fantasy. I did research historical figures, such as the scientists who inspire the time travel theory, the dinosaurs and plants of the prehistoric age, Lincoln’s boyhood life and friends, Davy Crockett, etc. But I also put dinosaurs in as I need them without regard for which actually would have encountered each other and I use time travel, so I’m not dealing with historical fact. What I am dealing with is fun and humor and lots of action. I wanted to write the kind of tale I’d enjoy as a kid. If there’s any message in the first book, it’s about friendship and heroes and working together to get through hard times. Those things naturally flow out of the story itself. And I think in future books any such “lesson” would have to work the same. There’s no intended lesson. I think different readers might get different things and that’ s great! I structured it like the old serials. Each chapter is like flash fiction piece around 1400-1600 words with a cliffhanger ending. So it can be read in segments but readers will keep wanting to come back. My friends who beta read it with their kids said the effect worked really well, as the kids looked forward to the next reading to find out what happens next. Being as there are humans and dinosaurs, there’s a bit of danger, yes, but it’s usually resolved fairly quickly so as not to overpower young readers emotionally. There are great action pieces including encounters with the aforementioned T-Rex, a Stegasaurus, a sabre-toothed tiger, and a bear which Davy Crockett dispatches at a much older age than three. In any case, I have done rough sketches of seven more books so far and am pretty sure I could do at least three a year and still keep producing my two novels a year and editing anthologies. At 13.5k, these chapter books use simpler wording and shorter sentences and can be drafted much more quickly. And as I get used to the voice, etc., I expect it will go even faster. The polishing took me a weekend after beta notes came back and I let it sit a few weeks. It’s a fun project to work on, one of the funnest I’ve had. It’s fun to write in a precocious young Abe Lincoln’s voice. And it’s also fun to play with the Crockett legend and all its exaggerations, using that for humor. And I get to write dinosaur scenes, okay? Can somebody pinch me? In any case, book 1, “Land Of Legends”, is off to the artist and in final edits at Delabarre. We expect to release it for the holidays, if all goes well. It’ll be in trade paperback and ebook, and I really look forward to sharing it with you. The world around us became less hazy again. Soon we were surrounded by trees with thick trunks and heights I’d never seen before. Leaves grew up the sides of their trunks, not just on their branches, and some of the leaves themselves were bigger than my head. “Where are we?” Jacob mumbled. Jacob and I exchanged a panicked look. Had the bear come back to life? It wasn’t aboard the machine. Nehemiah grumbled as he fiddled with the controls. The rest of us turned to see the giant green nostrils and gaping, sharp teeth of a mighty-jawed lizard. It stood at the edge of the trees, its small front arms flexing as it reared back on giant back feet and rambled toward us. The ground shook from its every step. The booming echoed in our ears. Jacob shook beside me, his mouth opening in a silent scream. “Something went wrong,” Nehemiah muttered. “We knew that!” Jacob called as we did our best to squeeze under the seats. The roaring sounded as loud as before. The time machine offered little shelter from those glinting, knife-like teeth. As I looked up at him, I saw the beast also had a jagged scar running down its right cheek. “Judging from the scar on its face, it can be wounded.” Davy jumped down to the ground and took aim with his rifle. “Shouldn’t we run?” I asked, looking toward him. “I’ll try and distract him, lead him away,” he replied, eyes locked on the towering predator. Davy took aim and fired twice at the raging animal’s legs. I saw the bullets tear into flesh and blood start to flow. The animal snarled and screamed but didn’t even slow down. Davy prepared to fire again. “To somewhere worse?” Jacob whined. Davy fired twice more at the monster then scrambled aboard. Nehemiah pushed a lever. The world faded and spun around us again as we felt the familiar sensation of time flight.